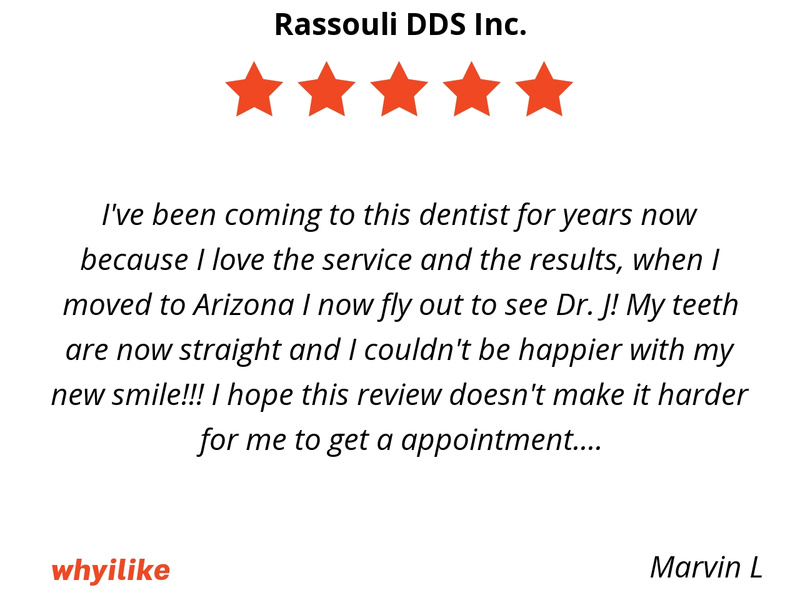 Why I like Rassouli DDS Inc.
925 E. San Antonio Dr. If you are seeking a general/cosmetic dentist or thought about getting your teeth straightened with Invisalign, you are at the right place! 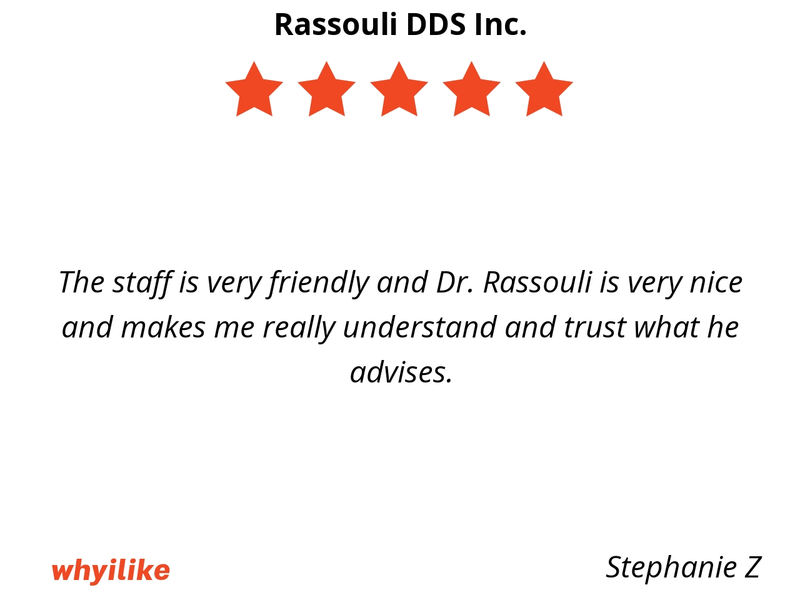 With many years of experience, Dr. Rassouli is a skilled cosmetic dentist and a premier Invisalign provider in Long Beach. Contact us today and let’s start your new smile journey together! They were educated at a highly recognized university (it was USC or UCLA), and have acquired lots of great experience over the years. They're humane and genuinely care and provide a public needed service, they follow the motto 'Do It Right The First Time', they always do a top notch job, they will never Short Cut or Band Aid. They will also work with you financially to the best of their ability. Their Staff reflects them and are great as well. My wife and I dissatisfyingly dealt with 4 dentist prior to Rassouli Dental. We were blessed and lucky to find Rassouli. I say this from personal experience. The staff at the dental office is absolutely fabulous. My friends and colleagues find it hard to believe, but I actually enjoy going to the dentist. 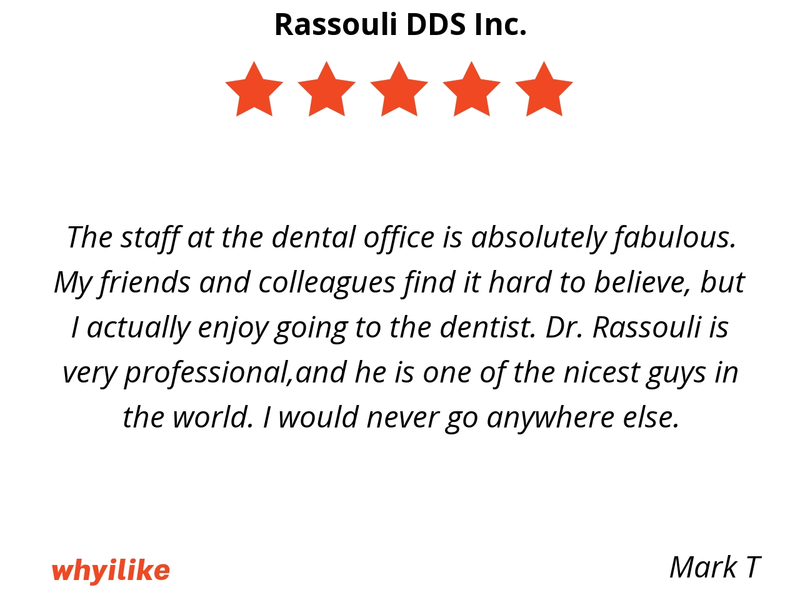 Dr. Rassouli is very professional,and he is one of the nicest guys in the world. I would never go anywhere else. The staff and himself are very pleasant and always with a great vibe. Makes going to the dentist a great experience with all questions answered. 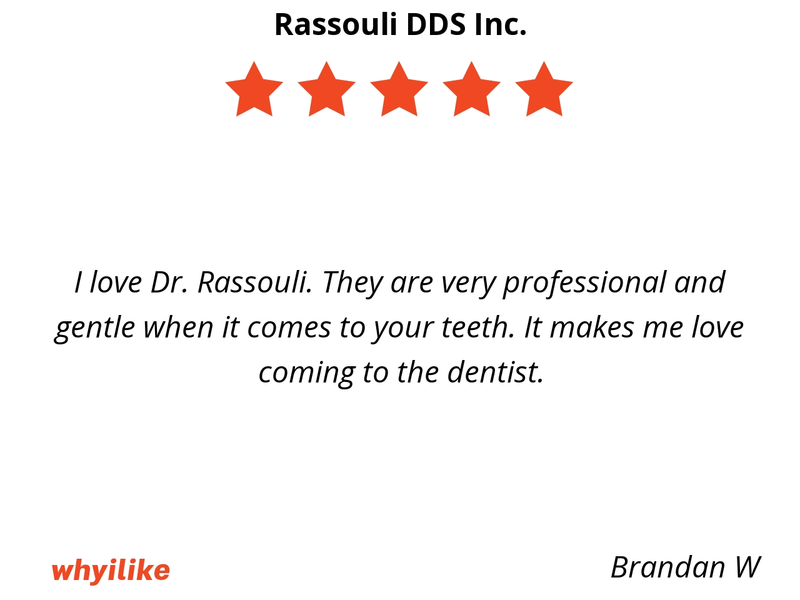 I love Dr. Rassouli. They are very professional and gentle when it comes to your teeth. It makes me love coming to the dentist. I came here on accidedent initially since I would see Dr. Middleton and didn't realize he had retired at the time of my next appointment. When I came I liked the way I was treated and also with the service I was provided with and decided to stay. I would recommend this office to anyone who is looking for a great and honest dentist. 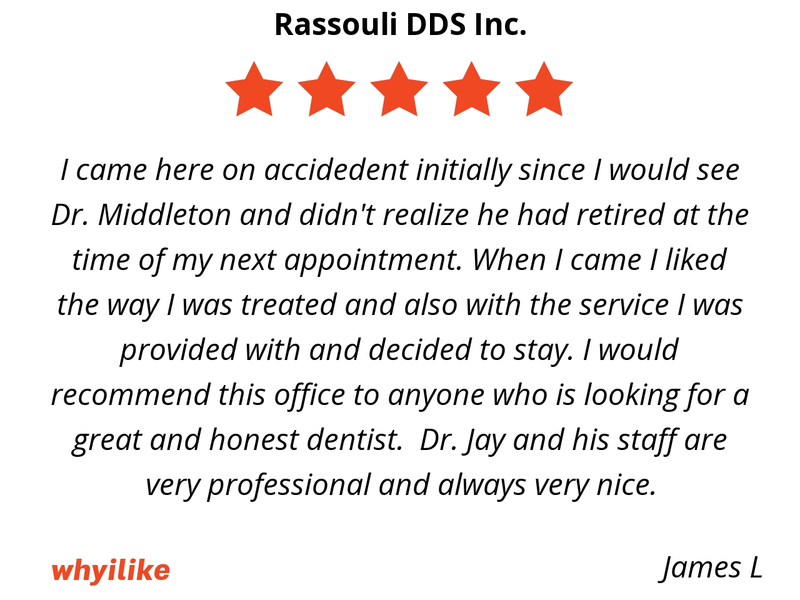 Dr. Jay and his staff are very professional and always very nice. The staff is extremely friendly and attentive. Always a pleasure seeing Dr. Rassouli. 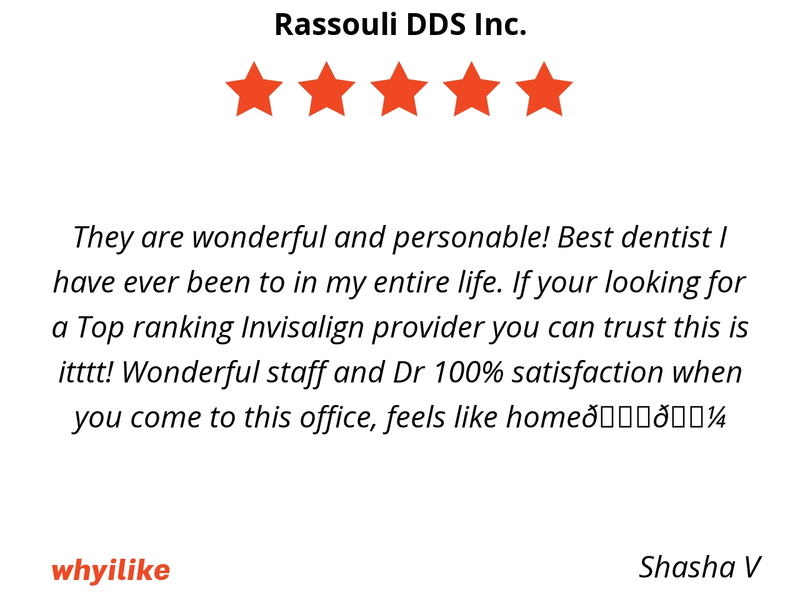 Dr. Rassouli is amazing. He's very thorough and gentle with my teeth. I enjoy coming to the dentist now. 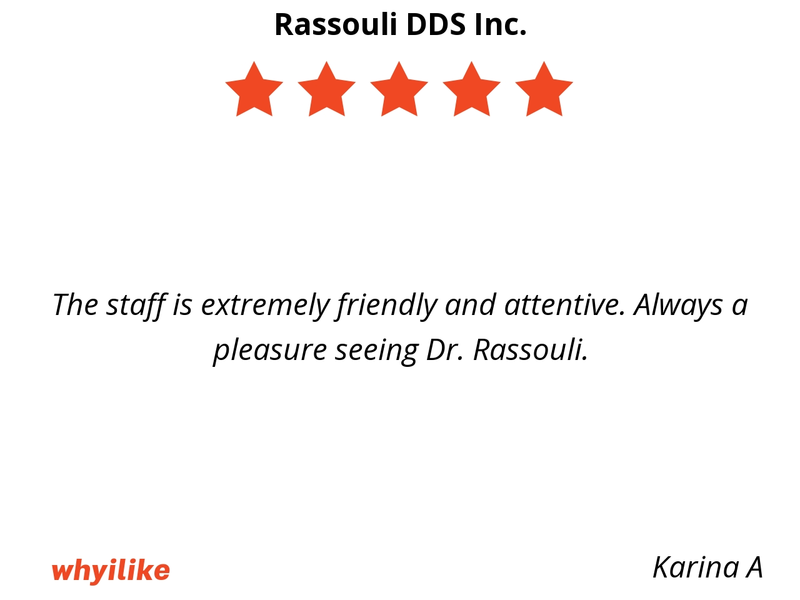 The staff is very friendly and Dr. Rassouli is very nice and makes me really understand and trust what he advises. I absolutely love this office! 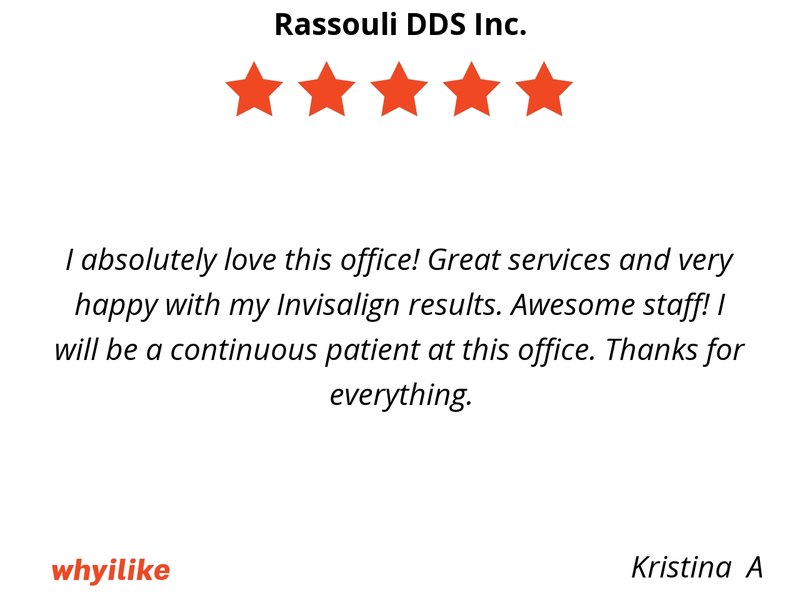 Great services and very happy with my Invisalign results. Awesome staff! I will be a continuous patient at this office. Thanks for everything. The staff areal ways professional and courteous and can calm even the most nervous patients. The office is clean an welcoming. I have found my dentist (and staff) for life. Check them out. You'll be happy you did! So very caring and sincere with me and my health and my life. And a great dentist who takes the time with me. I never feel rushed I feel like I am with family when here. They provide excellent service and great care. Their staff is among the friendliest and welcome I've experienced. 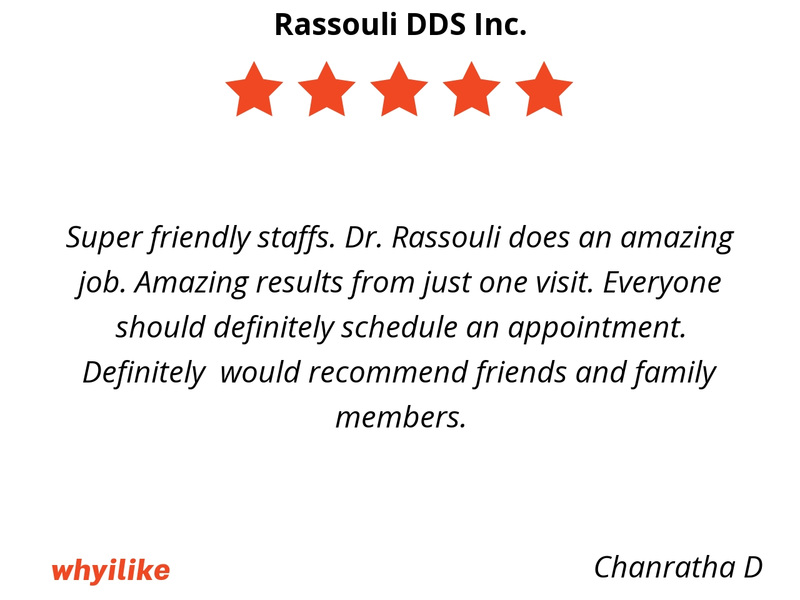 Dr. Rassouli is a conscientious and proactive dentist. He is up to date on all dentistry methods and cosmetic procedures. His team is gentle, caring, and provide excellent dental services. 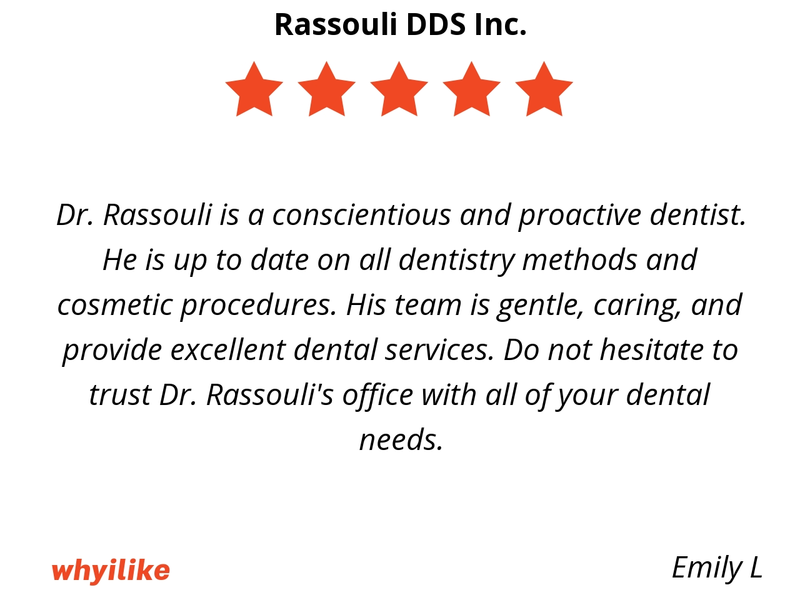 Do not hesitate to trust Dr. Rassouli's office with all of your dental needs. Quality attentive service. Knowledgeable and caring for best possible dental health. I love this place! My family comes all the way from van nuys to get the extra special care from Dr.s Rassouli and crew. 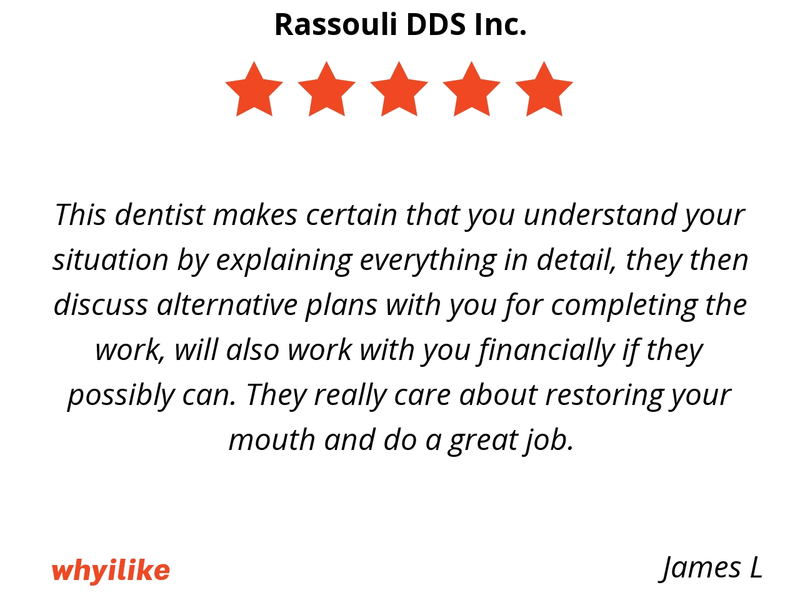 This dentist makes certain that you understand your situation by explaining everything in detail, they then discuss alternative plans with you for completing the work, will also work with you financially if they possibly can. They really care about restoring your mouth and do a great job. 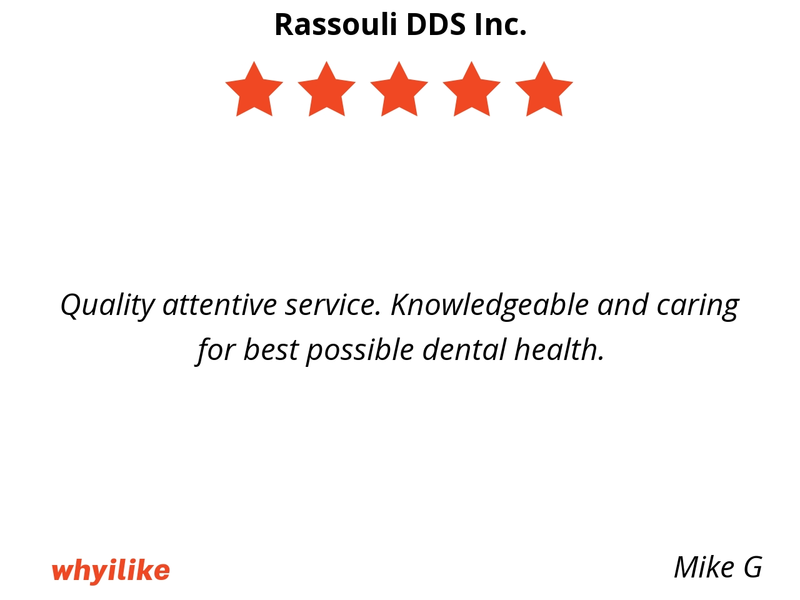 I will recommend anyone to Dr Rassouli for your dentist care, he's very friendly any very honest on his work. He promised me the time to complete my denture and taking care of other need, he made it on time but out of all I love the way he treats his patient like me. I will refer my whole family to be our dentist under his care. 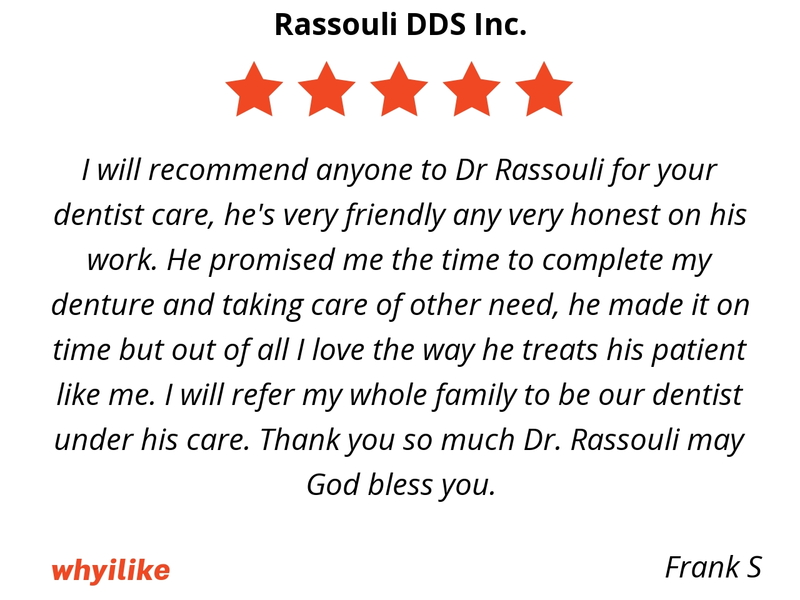 Thank you so much Dr. Rassouli may God bless you. Super friendly staffs. 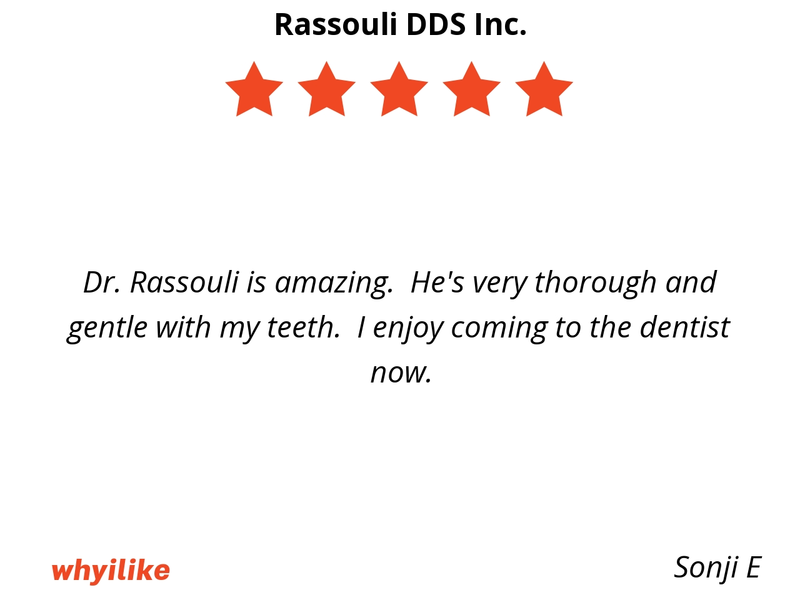 Dr. Rassouli does an amazing job. Amazing results from just one visit. Everyone should definitely schedule an appointment. Definitely would recommend friends and family members.